For my next session I switched to a wider lens (note how the DX Tokina has not vignetted, even on a full frame camera). This sequence was started just after moon-set, hence the glow at the horizon. Caught a couple of airplane trails, but still very happy with this image. I really like using this composite process, it's reminds me a little of the days of film, in that you don't quite know what you're going to get until the files are processed. It's great watching the image form and appear in Startrails. 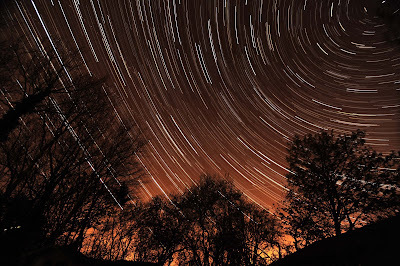 My First Ever Star Trails!